In my initial response to the Square Mile brief I thought a lot about The Wheres, The Whats and The Hows. But I forgot about The Why. Well, my conscious mind forgot about The Why. And I let it wander. Knowing I would come back to it eventually. After all, it’s the why-we-do-things part that is important. The idea behind the things we create. As people. As artists. I’ll be the last one to say that the intent justifies the means or the consequences. In general, it really does not! But when it comes to idea development, thinking and creating things the whys, the motives and intents behind an action matter a great deal. For this task, The OCA learning materials provides plenty of inspirational online resources. The photographers mentioned range from the winner of last year’s Barnack Award to inspiring projects made by OCA’s own students. It was a fun read. Visual puns and humor are always welcome. Whether the inspiration is from famous paintings and the art history in general or just silly visual absurdity. All subject matters are valid. It doesn’t matter if it’s your closest family or running water. Your neighbor’s dog is also fine. … Know why you do what you do, even when you don’t have no plan. “Home” is where both where you are from and where you currently live. Many photographers travel “back home”, some do not. A really good photographic series (in my humble opinion) carries a notion Wittgensteinian “family resemblance“. Where one can argue that things which could be thought to be connected by one essential common feature may in fact be connected by a series of overlapping similarities, where no one feature is common to all. Michael Ackerman (ongoing), Morten Andersen (2011), Leif Gabrielsen (2006), David Alan Harvey (ongoing), Anders Petersen, Laura El-Tantawy (2015) etc. These are people who have carried out projects in their own home town, perhaps taking pictures of their own family, neighborhood or favorite childhood view. Or, they are photographers who simply do their thing wherever they are. Doing picture-taking as an ongoing practice. Going somewhere or being somewhere? Notebook page: going or being? The “Square Mile” concept is a bit of both? In my mind I tend to differentiate between going somewhere in order to shoot something, and being somewhere shooting. Taking pictures. I actually loathe the word “shoot” when it comes to photography. But that’s a rant for a different day. In many ways the difference between “going somewhere” and “being” is an artificial one. Many photographers travel far yet manages to immerse themselves into whatever or wherever they are to make good images. In any case, most people don’t just stay on their sofa all day expecting to make a great image. They go somewhere, right? For me, the easiest option would have been to go back home. Talk to people; my family, my neighbours and the most amazing dogs ever to make bright Autumn photos. I’ve done it before. I know how it’s done. And the result would have been predictably beautiful. And fun. I could have cheated and used some images from Finnmark. Actually, my boyfriend told me to do this. And I just laughed. Yes, Vadsø is home. Home on so many levels it almost hurts to think about it. Yet, I am always a stranger there. Pretty much the same way as I always have been a stranger in the town I am actually from. In Norway blood, dialects and family names run way thicker than water. It is what it is. In any way, using archive material would have been cheating. And I am not in the mood to cheat on my first assignment. Even though Oslo is somewhat more difficult to work with than the other options. The city itself is a lot less picturesque than any vibrant yellow, green and red countryside. Of course it’s got its nice spots, all places have them, but areas that are “genuinely pretty” or easy to work with? – not so much. Here, Oslo is the place I live. The place I go to work and the place I study. It used to be the city of endless possibilities, to me. “Moving to Oslo” was on top of my to-do-list when I grew up, yet it took me a couple of extra years to get here. These are the places in Oslo I’ve lived, loved the most, or spent too much time at. 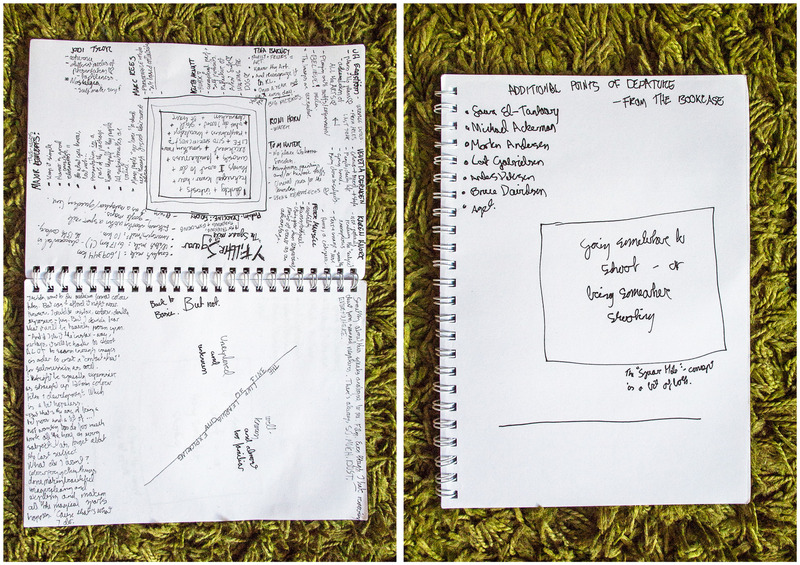 Idea Development – Walking and Thinking. There is a saying that goes something like this “change your place, change your luck”. And that is how I’ve approached the Square Mile project. The first thoughts were recorded on a laptop, me sitting on our couch at home. Much of my handwritten notes were written as I sat on the floor, on the green carpet, in our living room. As for the rest? On trains, airports, by a desk and on the floor of an empty photo studio. All the thoughts came from walking. A lot. Just bringing my camera along in my daily life. Letting it tag along, like in the old days when I was never without an image making machine of some sort. Walking and thinking. I even brought my camera to places that I knew had nothing to do with any square mile I knew about. Because the exercise was about renewing an old habit. Thinking and walking. Picture taking. My feet are my main means of transportation these days, so why not use it to my advantage? The flâneur is a well-known literary figure from 19th century Paris. A man of leisure, who walks the boulevards for his own pleasure and discovery. A form of Urban exploration, one may say. The modern Parisians have taken this term to hearts, and today flânerie is a part of their culture. Walking, high-spirited, without any map and goal but the journey itself (Sciolino, 2015). Or in the words of Edmund White “(…) that aimless stroller who loses himself in the crowd, who has no destination and goes wherever caprice or curiosity directs his or her steps.” (2001). In other words it is not so much about a style in photography, but more about a state of being. I once heard a description of William Klein’s first photographs of New York City; how he’d just gotten off the boat and started taking pictures of the people he saw, like there was no tomorrow. Taking everything in. Capturing it, by light and shadow. To me, this has always been a part of flânerie means. To be “in the zone”, whatever the zone is. Sometimes just breathing fresh air and hearing all the people is enough. Sometimes “the zone” means doing it all, with a camera in hand. However, as much as I wanted to get good images, I was a lot more interested in what this kind of approach would do to my photographs; what it would do too me. In Norway we’ve got really strict privacy laws about the publishing of people’s likenesses. My understanding has always been that unless you are a working photo journalist taking an image of a situation, rather than a picture of a person you need their permission to publish your picture of them. They need to know the context and the time of publication, and agree to it. Over the years I’ve explicitly trained myself to never do classical street photography. To ignore possible images, settings and surroundings that might make we wanting to practice it. Så vidt jeg vet, pleide ingen av de kjente gatefotografene, som Henri Cartier-Bresson, Robert Frank, Alfred Eisenstaedt, William Eggleston, Bruce Gilden eller Garry Winogrand, å innhente samtykke fra de personer de avbilder i egenskap av gatefotografer. (…) Men gatefotografi er en populær sjanger. Stadig ser man gatefotografi offentliggjort, både i aviser og tidsskrifter, på fotoutstillinger, og på nettsteder for fotointeresserte. Så lenge fotografen ikke opptrer plagsomt og invaderende, og avbildningen er gjort med respekt og verdighet, ser det ut til at de som forvalter redaktør- og kuratoransvaret på de ulike publiserings­arenaene ser gjennom fingerene med kravet til samtykke. Det finnes, meg bekjent, ikke rettspraksis på dette området. Men så lenge bildet eller bruken av bildet ikke krenker den som er avbildet, ser det ut til gatefotografi i Norge betraktes som situasjonsbilder og av den grunn skjærer klar av samtykkekravet (Hannemyr, 2007. Emphasis added). As long as the photograph, or the publishing of the photograph, does not offend the person on the photograph, it seems like street photography in Norway are regarded as pictures of situations and therefore do not need explicit consent before publishing (Hannemyr, 2007). My translation of the last sentence in the quote. Home is the place that feels like home. A place you don’t have to think about everything that goes around you. You trust it to be there. The everything. So that you can concentrate on other things, like living. – for instance. That kind of effortlessness, an area of ease, is what I found The Square Mile to be. A place I know, but isn’t tired of just yet. My “Square Mile”. I have no Idea how many square meters it actually consists of. I am practicing shooting from the hip (apparently it is doable with enough practice) with a 40mm-e lens on a digital camera. Perhaps this will change. Of 130 pictures, got two that I kind of liked. My focus on walking, feeling and thinking brings They’ve got a dreamlike quality to them, something soft and quiet. Sometimes walking outside with a camera is a challenge enough by itself. Sometimes walking is hard enough, never mind stopping to take a photo. May the may the odds be ever in (y)our favor. On my way back I visited the Oslo Photobook Festival, that had it’s last day today. Sometimes the fall kills you. And sometimes, when you fall, you fly. – Neil Gaiman from, The Sandman. (Vol. 6: Fables and Reflections (1994). page number not found, since I don’t have the volume here right now). Taking pictures with a dog on a leash. Taking pictures without a dog. Today was the big street art day (there’s a lot around here). And at night there was Elvelangs. 370 images in all. What I’ve discovered is that my confidence is rising. Which is a good thing. I am hurrying less in my stroll. Got to borrow a camera with better iso performance for the Elvelangs session. I am planning to use that camera for my last day of shooting tomorrow as well. Last day of picture taking. The world is wet and gray, the asphalt reflects everything like a mirror. – if the sun would just peek out for a moment. The funny thing is that my plan is and have been to NOT call upon the people I know, and photograph them. I am pretty sure I’ll take pictures of them for my assignments anyway, so I wanted to spare them for this first one. But when I sit in the living room of my cousin, who’s an Artist, I feel pretty stupid. Even as I tell her what I am doing. A lot more possible keepers today. My aiming both from the hip and in passing have become a lot better, and I am lot more relaxed when making pictures in the public of the public. But the thing is that I don’t know yet whether the new images actually fit with the other photographs I’ve made. 347 pictures found. Go me. You know how it is; Two days after my last official day of shooting the light was perfect and I suddenly found a window in my to-do-list for photographing. Just a tiny bit. Just for fun. This time I stopped, felt and saw before releasing the shutter. Almost like a walking meditation. Very much unlike the stream-of-consciousness-like photography I’d been practicing earlier during this assignment. In the end I still like quiet photographs the best. The ones that either remind me of that moment between the inhale or the exhale, or carry the feeling of breathing out. Slowly. 36 photographs, a 40mm lens, and a digital camera. Sometimes this is all I need. Andersen, M., 2011. Black and Blue – Morten Andersen: Oslo: Shadowlab. Anon, 2013. Peter Mansell, Open College of the Arts. Available at: https://weareoca.com/photography/peter-mansell/ [Accessed September 5, 2016]. Anon, 2015. Jodie Tylor, The Open College of the Arts. Available at: https://weareoca.com/photography/jodie-taylor/ [Accessed September 5, 2016]. El-Tantawy, L., 2015. In the Shadow of the Pyramids, Amsterdam: Self-Published. Gabrielsen, L., 2006. Identitet, Oslo: Conflux . Gaiman, N., 1994. Fables & Reflections, Bt Bound. Hannemyr, G., 2007. Begrensninger for fotografen. Lommejuss omkring digitale medier. Available at: https://hannemyr.com/faq/legal_dm07.shtml#limph [Accessed October 30, 2016]. Harvey, D.A., 2012. Road Trips – Burn Magazine. Burn Magazine. Available at: http://www.burnmagazine.org/category/road-trips [Accessed November 1, 2016]. The Leica Camera Blog, 2015. JH Engström: Leica Oskar Barnack Award Winner 2015 – The Leica Camera Blog. The Leica Camera Blog. Available at: http://blog.leica-camera.com/2015/07/09/jh-engstrom-leica-oskar-barnack-award-winner-2015/ [Accessed November 1, 2016]. Lundiestoreis, 2015. Isa, Edda, Aki, & Tiril (@lundiestories) • Instagram photos and videos. Isa, Edda, Aki, & Tiril (@lundiestories) • Instagram photos and videos. Available at: https://www.instagram.com/lundiestories/ [Accessed September 30, 2016]. Sciolino, E., 2015. The Flâneur Discovers Paris, a Step at a Time. The New York Times. Available at: http://www.nytimes.com/2015/10/04/fashion/the-flaneur-discovers-paris-a-step-at-a-time.html [Accessed October 10, 2016]. TPW, 2016. Michael Ackerman – True stories. TPW where photography and creativity meet. Available at: http://www.tpw.it/portfolio/michael-ackerman/ [Accessed November 1, 2016]. White, E., 2001. The Flâneur: A Stroll Through the Paradoxes of Paris, New York: Bloomsbury. Wikipedia, 2016. Family Resemblance. Wikipedia. Available at: https://en.wikipedia.org/wiki/family_resemblance [Accessed November 1, 2016].